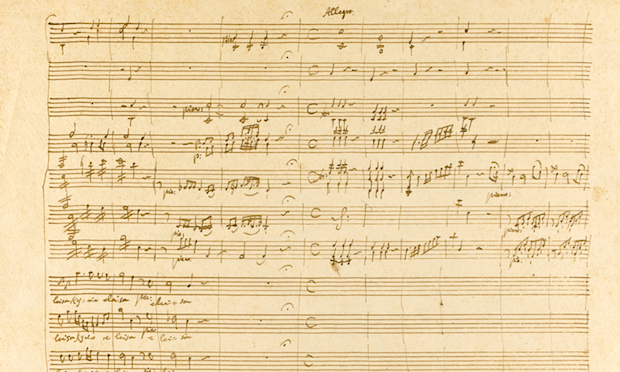 Musicology Now: That Mozart Autograph . . .
... fetched almost $1 million (£578,500 = $972,285, hammer price plus buyer premiums) at the Sotheby's sale in London on 20 May 2014. In the same sale, the autograph of Rimsky-Korsakov's Second Symphony sold for over $2 million (£1,202,500 = $2,021,042). 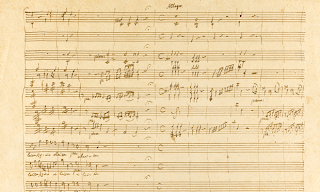 The Mozart manuscript, five pages containing 49 bars of a Kyrie in C, K. Anh. 18 (166F), written when he was 16, comes with proper intrigue, having not been widely seen since it was smuggled away from Germany by its owner in 1938; the titled wrapper, sent with the family furniture in 1939, was lost when the freighter was torpedoed and sank. And in other (frenzied) news . . . So much for light beach reading.